Alonnisos is a perfect little island in the Sporadic Archipelago. The exceptionally beautiful Greek island is not visited by many tourists, and has therefore not lost its wonderfully relaxing atmosphere. Nevertheless, Alonnisos has sufficient tourist infrastructure to make sure that all necessary commodities can be provided. 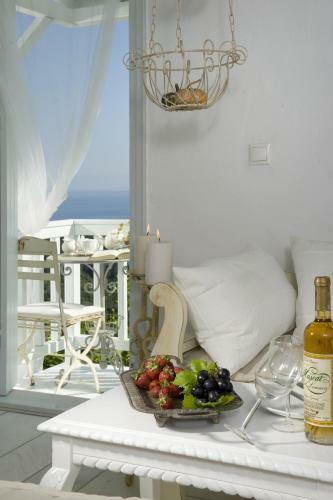 Many hotels, apartments and studios have been modernized and represent the trendy, new image of the Greek islands. ‘How come I didn’t find this place before now?’ most people wonder when they return from their holiday on Alonnisos. Only about 1800 people live on the island, more than 50% of them in the capital of Patitiri. This is where the inhabitants of the original capital of Chora had to move to after a massive earthquake had destroyed their home-town. Fortunately the old capital in the mountains has been revived in the course of the last decades. Many former tourists have bought houses there and had them tastefully renovated. The little town looks lovely in its new glamour and should definitely be on every visitor’s list of things to see on Alonnisos. Alonnisos is above all famous for the herbs that are growing there. Accompanied by a guide, holiday-makers can collect their own herbs in the scenic countryside, and they make a perfect souvenir. The island has beautiful beaches, but apart from one, all of them are shingle beaches. The majority of the beaches are situated on the east coast and afford a fantastic view of the marine national park where the last specimen of the Mediterranean seal live in a protected environment. Those who like boating on the sea can hire a small motor boat. Up to 30HP a driving licence is not required in Greece. The view of the island from the sea is a worth-while experience, and those who like their privacy can go to the uninhabited little island of Peristera and enjoy the solitude of one of its deserted bays. Those who want to spend a relaxing holiday on a very lush and quiet Greek island with a good infrastructure, might have found the island of their dreams on Alonnisos. The old capital of Alonnisos is definitely one of the most beautiful villages on the island. Chora is a mountain village, and the panoramic view of the sea is fantastic. The restaurants are famous for their amazing barbecue dishes, and the locals love having their dinner here. The best place to stay is in one of the village’s private stone houses that have been renovated and modernized by their new owners. The village was virtually destroyed by an earthquake in 1965, and most of the population went to live in Patitiri instead. Chora is still in the process of being rebuilt – there are accommodation options, taverns, bars, a small supermarket and a few souvenir shops, but if you want a bakery or a cash machine, you have to go to Patitiri. The bus connection is not very reliable, so holiday-makers are better off getting a hire car. If you can’t, there are always taxis. The small beach resort of Chrysi Milia has been built around the only sandy beach of Alonnisos. It is located just outside the capital of Patitiri, and there is a hotel at one end of the beach and a tavern at the other. On the beach you can hire deckchairs and sunshades, and the beach tavern serves excellent barbecue dishes. The water is shallow and clear, ideal for families with small children, but also for scuba diving and swimming. There is ample parking by the beach. The romantic little fishing village of Kalamakia is only a few kilometres from Steni Vala. When fishing boats return to the harbour, their catch is immediately processed by one of the four taverns on the beach. The local fishermen boost their income by running taverns as well. Considering that the resort only consists of one hotel, a few studios and six taverns, holiday-makers have a lot of choice from the gastronomic point of view. Apart from that, the resort has no infrastructure and no recognizable centre. Marpunta isn’t really a resort at all. It is just the admittedly stunning hotel complex of the Village Club Marpunta Hotel, part of the group of Small Luxury Hotels. For people who want an all-inclusive holiday in a beautiful setting, Marpunta is ideal. It is very popular with Italians and some of the staff are Italian too, which can cause problems with other nationalities. The capital of Patitiri is within walking distance. Patitiri became the new capital of Alonnisos when the old Chora in the mountains was destroyed by an earthquake in 1965. The resort is arranged prettily around the harbour and there is a whole line of taverns. Along the two arterial roads a variety of shops can be found. There are pharmacies, car hire places, supermarkets, a butcher’s and a fishmonger’s, for example. Most importantly, the only cash machine on the island is located in Patitiri next to the taxi rank. The small capital might be suitable as a holiday resort, but – as is the case with many capitals of Greek islands – other places are prettier. Those who are planning to stay for more than a few days should have a look at the other resorts as well. The small harbour village of Steni Vala is famous for its fish taverns. This is where the locals go when they want to eat out and they want the best fish available. Steni Vala is also popular with yachtsmen because of its sheltered harbour. There are usually quite a lot of yachts mooring at the jetty in order to replenish their stores at the local mini markets. Steni Vala also has a Diving Centre for those who enjoy scuba diving and snorkelling in the exceptionally clear water. The beautiful bay of Votsi makes you think of Mallorca. The sea has eaten its way into the island of Alonnisos and created a small natural harbour in the process. A few boats are anchored here and are mainly used for excursions by the locals. Not far from the village the Homoeopathic Institute and its school can be found. Around the pretty bay there are a few hotels and restaurants. Votsi is within walking distance of the capital of Patitiri, so people in search of evening entertainment can just walk there along the beach. For a totally laid-back life-style the harbour bar of Illias is a good example; not infrequently people coming in for a drink find an empty bar with a note saying: “Popped out for a bite to eat, back in two minutes”.